Chard's 'Yates on Yates' land acquisition details. 4 lot assembly for $10.4M. The large mid-block parking lot on Yates between Quadra and Blanshard has significant development value. The land owner and prominent Victoria private developer, Chard, has submitted his revised plans for what is going to be known as ‘The Yates on Yates’. the Yates on Yates is across the street from Chard’s 100% rental project at 819 Yates (under construction) and stratified 834 Johnson building (completed 2011). The nearby rental building, 819 Yates, contains 209 suites and will be sold in full to a Canadian Pension Fund consortium upon completion. A great example of a successful partnership between institutional capital and local businesses. Victoria’s 0.5% vacancy rate will continue to attract large investor groups and spur more rental construction. Tower A is a 21 storey market rental building fronting along Johnson Street. Includes 75 one bedrooms, 36 two bedrooms, and 2 two bedrooms. Total residential units: 113. Additionally 2,240 sqft of CRU’s will be at the podium. Tower B is a 21 storey stratified condominium building fronting along Yates Street. Includes 52 one bedrooms, 3 one bedroom + den, 41 two bedrooms, 11 three bedrooms, and 4 two bedroom ground oriented townhouses. Total residential units: 111. Additionally 5,650 sqft of CRU’s will be at the podium. Chard is known for his well executed amenity and rooftop areas. This project follows Chard’s skill set in creating inviting and beautiful open spaces. There will be no public courtyard, but the two towers will overlook onto a 3rd floor outdoor greenspace. Both towers will have a shared rooftop patio space including a outdoor kitchen, kids play area, lounge, dog area, fire bowl, and dining areas. 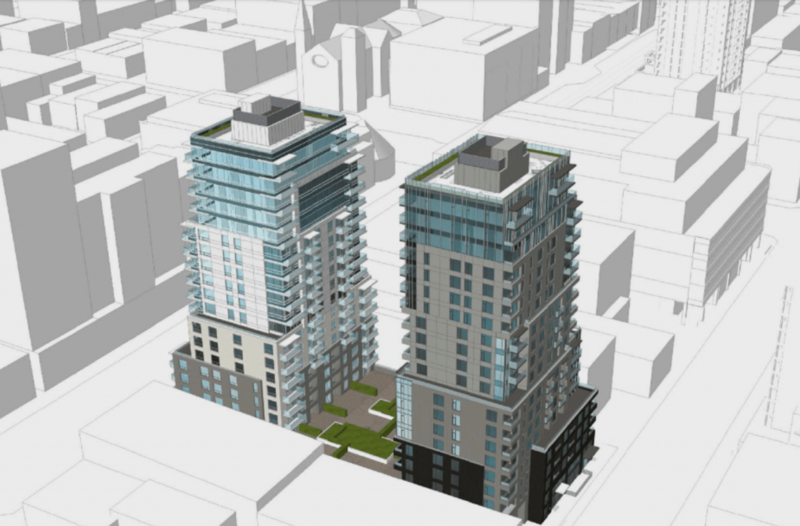 two residential and rental towers on Yates and Johnson st. Rental (left), Sale (right).